Assume that you have two cars; an SUV and a compact car. Both cars are aging but you can only afford to replace one. Assume further, that like many families, you still require at least one car with a carrying capacity greater than what a compact car can offer. From both a fuel economics and an emissions perspective, which is the better option? Let’s see how both options fare over a 100 mile trip. In scenario (a), the mid-size sedan will save 3.1 gallons over the gas guzzling SUV. At $3.50 a gallon that equates to $10.83 in savings every 100 miles driven. In scenario (b), the extremely fuel efficient hybrid will only save 1.3 gallons over the already fuel efficient compact car. At $3.50 a gallon, the family would save only $4.57 per 100 miles driven. This comes as a surprise to many who would expect the 55 MPG hybrid to offer the most fuel savings, when in reality it’s generally more beneficial from a fuel-cost perspective to simply get rid of the gas guzzling SUV. Similarly, scenario (a) is better than scenario (b) from an emissions perspective. The primary emissions byproduct from the combustion of gasoline is carbon dioxide (CO2). For every gallon of gasoline consumed, about 19.4 pounds of CO2 are released into the atmosphere. In scenario (a), the SUV will produce over 60 pounds more CO2 than the sedan per 100 miles driven. In scenario (b), the compact car will produce only 25 more pounds of CO2 than the hybrid over the same distance. When looked at over the course of a year, the benefits of scenario (a) over (b) in both fuel savings and emissions reductions really begin to add up. Even with a conservative estimate of 10,000 miles driven per year, a family that swaps out the SUV for a sedan will save $627 more than if they traded the compact car for the hybrid. That amounts to annual savings sufficient enough to be considered along with the purchase price of a vehicle. Just as staggering is that swapping out the SUV for a sedan will save over 6,000 pounds of CO2 from entering the atmosphere each year, compared with only about 2,500 pounds the hybrid will save over the compact car. 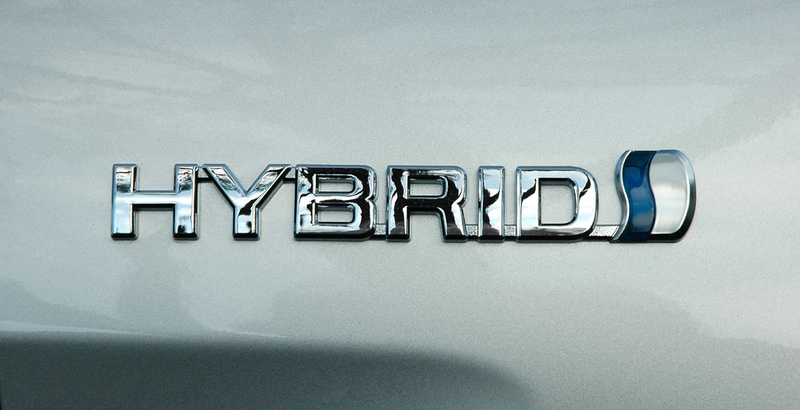 So while there are many factors to consider when replacing an old vehicle with a new one, it’s clear that simply from a fuel savings and emissions perspective a hybrid may not always be the prudent choice. This entry was posted in Energy, Energy Efficiency, Greenhouse Gas, Renewable Energy, Transportation and tagged Energy, Gallon, Gas, Greenhouse Gas, Hybrid, MPG. Bookmark the permalink.